Snapshot: The LexSun Standard MK2 Juicer is a cold-press juicer with 1 speed plus reverse and an external pulp container. How well does it juice and is it easy to clean? Good results for green leafy juice. Small detachable parts fit easily in the sink for cleaning. 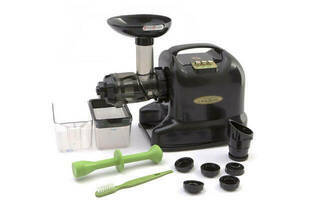 Has puree, mincing, noodle and pasta attachments. Has sieve to separate pulp. Very narrow chute size so produce needs to be cut into small pieces. Juice can come back up the spout when juicing oranges. Lifetime motor warranty, 5-year parts warranty.